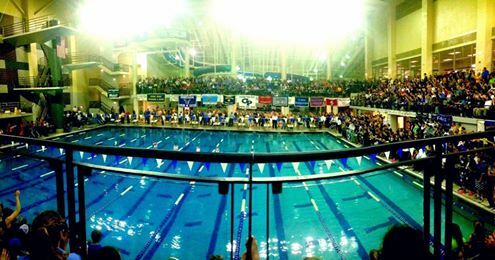 It took us a few hours to really digest what we saw Saturday night at the Germantown Indoor Swim Center, but in the end it was really fast swimming…again! Year after year this meet does not disappoint with spectacular individual and team performances. In regard to the team performances, the girls championship race Holton-Arms came into the meet riding high after their team wins in the ISL and WMPSSDL championships, while defending champion Sherwood was poised from an undefeated dual meet season and the MCPS Division 2 title. Also in the hunt were Stone Ridge, who captured the National Catholic title in January and B-CC who captured the MCPS Division 1 title. Holton-Arms didn’t leave much to chance as they stormed through the prelims and had 28 finalists- 15 in the A-final (Top 10) 10 in the B-Final (11-20) and three divers that scored in the top 20. Sherwood was next closest to Holton in terms of swimmers making the final session, with 16 total finalists, 10 in the A-final, 6 in the B-final. B-CC followed with 15, 10 in the A-final, 3 in the B-final and 2 divers that scored in the top 20. Rounding out the challengers for 2nd place, Stone Ridge had 11 finalists, all 9 making the A-final, and Genevieve Thibodeau, who won the diving event on Thursday. The boys championship was up for grabs as defending champion Churchill returned 25 to finals, 10 to the A-final, 11 to the B-final and 4 divers that scored in the top 20. Georgetown Prep had 18 finalists, with 13 in the A-final, 2 in the B-final and 3 divers that scored in the top 20. Whitman was next with 19 finalists 8 A-finals, 9 B-finals and 2 divers that scored in the top 20 and Walter Johnson had 18, 9 in the A-final, 7 in the B-final and 2 divers that scored in the top 20. 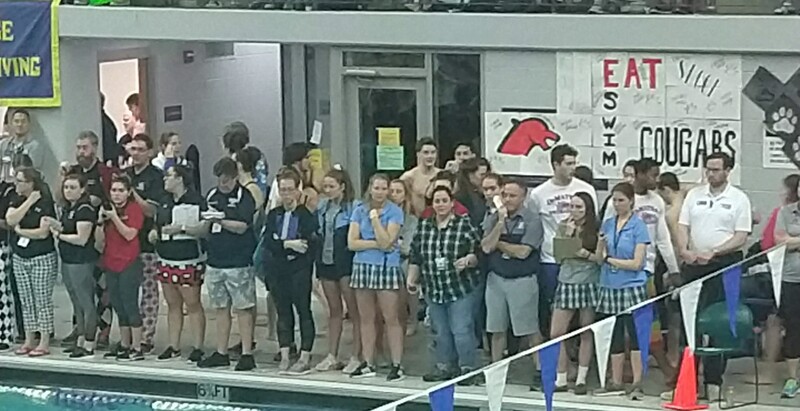 The meet started off with Georgetown Prep and Holton-Arms taking the 200 Medley Relays, Prep swimming to an Automatic All American time and Holton accomplishing a All American consideration. Absent from the girls race was the team from Stone Ridge that was disqualified during preliminaries for a not-often called technical infraction on the freestyle leg. 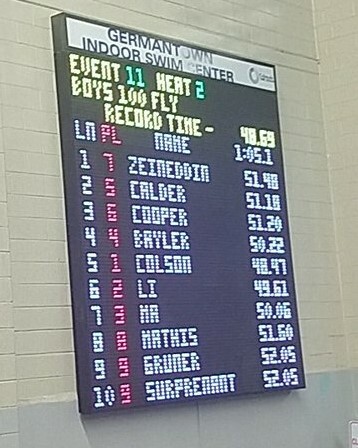 As if the crowd needed additional energy after the relays, the boys 200 freestyle gave it a whirl- Ryan Vipavetz from Good Counsel shot out into the lead, followed closely by Jacob Rosner from Landon. As Ryan was churning away, the crowd could see he had a chance at setting the Metro record. The roar crested to an applause of appreciation as he finished 5 tenths off the record, but in the process achieved an Automatic All American time of 1:37.65. The boys 200 IM race kept the crowd on their toes as the lead changed several times throughout the race. Alex Colson from Wheaton put his best stroke to work in the first 50, dropping a 23.19 butterfly split. Timmy Ellett from Walter Johnson and Noah Rutberg from Churchill brought the race closer as the trio turned to breaststroke at a virtual tie. Timmy then out-split the field by a full second in breaststroke and never looked back, winning in an Automatic All American time of 1:48.46. Later we found that Noah Rutberg, who would have finished 4th with his time, received a disqualification for an infraction on his breaststroke turn. The girls 200 IM wasn’t exciting for its head to head battle, rather for the blazing time Phoebe Bacon posted. She led the race start to finish, splitting 25.08 in the fly (a full second ahead of the field), 28.45 backstroke, 35.32 breaststroke and bringing it home in 28.46 on the freestyle leg. Her time of 1:57.31 was more than 8 tenths faster than the old meet record set in 2012, and a full 5 seconds ahead of second place finisher Catherine Belyakov of Quince Orchard. In the 50 Freestyle, also coined the ‘splash and dash’, Steven Mendley of Churchill posted the fasted time in prelims and held that position in finals, as he was the only swimmer under 21 seconds in the field. The race for second was close as Gabriel Laracuente from Good Counsel swam a 21.15 to beat out Adam Fischer from St. Stephen’s and St. Agnes and Jacob Lindner who tied for 3rd, swimming a 21.48. The girls race went to the freshman phenom from Damascus, Carly Sebring. Her All American time of 23.17 was just ahead of defending champion Keyla Brown of St. John’s. Alex Colson brought the crowd to their feet once more with his win and new meet record in the 100 butterfly. He was tested in the first 50 by Alan Li of Blair and Chris Ma of Richard Montgomery, but his second 50 speed was too much as he split a full second better than the field with a 25.30 and touched the wall first in 48.47 to Alan Li’s 49.61. Carly Sebring was up next to complete her ‘double’ by holding off a hard-charging Abby Carr of Washington Christian Academy and touching the wall first in 53.93. Both Carly and Abby achieved Automatic All American times as Abby finished second with a time of 54.09. In the girls race, Olivia Jubin of Holton-Arms set the pace and kept the lead for the duration of the 4 lengths, winning in a time of 51.46, just off her prelim time of 51.40. Jillian Berger of B-CC took second in 51.83 and Makenzie Higgins of Stone Ridge was the only other girl under 52, finishing in 51.99 for third place. Ryan Vipavetz of Good Counsel completed his ‘double’ with a commanding win in the 500 free. He charged ahead from the start and by the 200 was close to 2 seconds ahead of the field. His Automatic All American time of 4:25.63 was a second faster than his winning time last year. In the girls 500 there was a bit more drama as Sophie Duncan from Holton-Arms took the early lead, with Kaitlin Gravell of Sherwood catching and passing her after at about 375 yards. Kaitlin touched first in 4:54.34, Sophie second in 4:55.31 and Sophia Ryan, also of Sherwood in third 4:55.69, all three times All American Consideration. The winner of the boys 200 Free relay was a bit of a surprise with Good Counsel taking the title. They entered a lineup, and swam a time much faster than what they had accomplished at both the National Catholic and WMPSSDL meets. For sure they had the right combination for this meet. The race began with Wheaton’s Alex Colson setting the pace with a 21.07, Ryan Vipavetz led off for Good Counsel, not far behind in 21.19. After the 2nd exchange, Good Counsel had a slight lead over Walter Johnson, who thanks to Timmy Elletts split of 20.58 was right in the thick of the race. After the third leg, Good Counsel still had the edge on Walter Johnson, but now Georgetown Prep was also in striking distance. Gabriel Laracuente had the anchor leg for Good Counsel and dropped the fastest split of all the swimmers with a 20.49, finishing ahead of Prep, anchored by David Fitch. The girls race featured a showdown between the sprinters from Holton-Arms and Walter Johnson. Walter Johnson took the early lead with great swims from Maya Drill and Molly Benson. However, Sophie Duncan and Olivia Jubin went on to split 23.36 and 23.74 (the only other swimmer to break 24 in the race was Walter Johnson’s Molly Benson) to seal the victory in 1:35.75, an All American Consideration time and .36 off the Metro record. 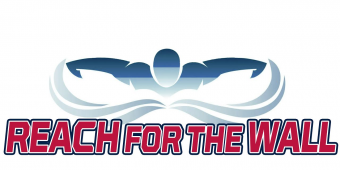 The boys 100 backstroke saw three swimmers go under 50 seconds, with Brett Feyerick of Prep taking the win in 49.00, Noah Rutberg of Churchill was second in 49.77 and third was Andrei Schwartz from St. Albans in 49.93. Only Brett’s time is an automatic All American the other two are Consideration times. The girls race was won by Abby Carr of Washington Christian Academy with an All American Consideration time of 55.70, she was followed by Jing-E Tan of Holton Arms in 57.01 and Sarah Culkin of Good Counsel in 57.13. Timmy Ellett of Walter Johnson completed his ‘double’ by winning the boys breaststroke event in an All american Consideration time of 56.77 and Phoebe Bacon cruised to her ‘double’ winning the girls race in an Automatic All American time of 1:01.46. Catherine Belyakov of Quince orchard placed second in 1:03.11 and Jazz Barry of B-CC third in 1:03.31, both All American Consideration times. The final race of the night got the crowd into a frenzy as the winner of the boys race was likely to determine the overall champion of the meet. 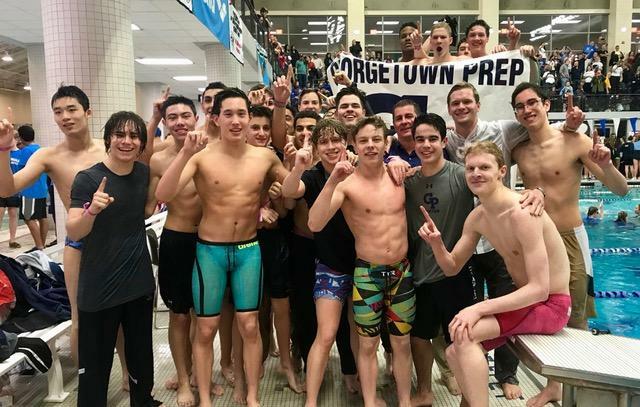 There was no ‘running score’, but swimmers and spectators alike knew Churchill, Georgetown Prep and Walter Johnson were in contention. Good Counsel led off with Ryan Vipavetz, who put his team into the clear with a leadoff split of 45.79. Next closest was Churchill, then Quince Orchard. Andrew Munson of Good Counsel expanded the lead with a split of 47.50, which was a full second faster than the second legs of every other team. Georgetown Prep and Churchill started to make their moves on the third leg, with Prep’s David Fitch splitting a 46** and Churchill’s Rutberg going 45.89. At the last exchange Good Counsel’s lead had dwindled to 2 tenths of a second to Churchill and 5 tenths to Prep. The final leg for Good Counsel was swum by Gabriel Laracuente who split a 45.29 to hold off Brett Feyerick who split a 45.09- the final time 3:07.28 to 3:07.56, both All American Consideration times. The girls race was a bit less dramatic in terms of the team standings, but no less exciting. Stone Ridge led off with Makenzie Higgins who put them in the lead with a 52.37. The second leg was swum by Erika Chen who blasted a 50.80 and put Stone Ridge 2+ seconds ahead of the field. Tia Thomas held the lead for Stone Ridge, and at this point some of us in the stands checked the clock and did some quick math to see what Phoebe would have to split to break the Metro record…we were thinking high 48 would do it…Phoebe took off and at the first 50 was fast! She kept churning the second 50 and when she hit the wall, the clock read 3:25.63- a new meet record! Her 100 split time was an eye-popping 49**!! **After receiving reader feedback and reviewing the official results, we edited the splits for Prep’s relay as well as Phoebe Bacon. The timing system/results did not accurately reflect their times. Needless to say this was a fantastic way to finish the meet and looking at the crowd, everyone had a smile for what they just witnessed. Metros brought the intensity and excitement and Good Counsel showed some of the swagger reminiscent from past decades where they vied for the team championships. However, we do have to mention there was a certain element missing both in the pool and in the stands with a few teams opting not to compete this year, we hope to see them back next year. Georgetown Prep celebrating their team win! What have to be done to get to disqualified on free style leg? Yes. As a freestyler, her natural flip turn is to leave the wall on her back, which most coaches train because it is fastest. It is permittednon freestule, but not permitted on the freestyle portion of the medley relay or IM. It’s a ridiculous rule. Why permit a butterfly kick on breastroke or freestyle portion of a medley? Isn’t that another stroke? The following link is a great summary of the history and problems with the rule. In Sept 2017, the rule was relaxed to allow pushing off the wall towards your back on the freestyle portion of the medley or IM so long as you don’t start kicking or take a stroke before turning past vertical towards your breast. Tell me, how many times does a coach tell a sprint freestyler to immediately start kicking off the wall? Thus, they really have to learn to push off towards the breast for medley relays, which is not how they train tirns for freestyle. Yes, also 44.19 for the third leg. Why did Gonzaga boycott Metro? 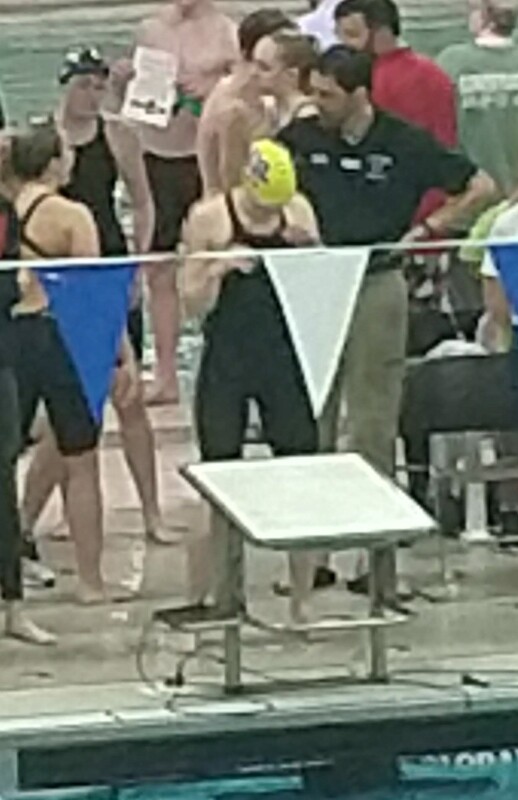 Phoebe Bacon is quite fast, but I’m sure her split for the 400 freestyle relay was more in the ballpark of a ~49. The third leg, Tia Thomas, most likely went a ~53, not a 55 as the results said.